Nissan e-dams’ smiles after FP1 were wide like rivers, but after Sanya’s second free practice session they could reach across the Pacific. Sebastien Buemi would take the headlines this time, and slap down a worrying marker for the rest of the Formula E field. Lucas Di Grassi was the first to touch the highest echelon in FP2, leading the initial runs from Sebastien Buemi and Oliver Rowland in the two Nissan e-dams machines. Jean-Eric Vergne’s woes and misfortunes instantly carried themselves over into this second session, meanwhile. A trying lap put him 8th, but he began to suffer similar braking issues as the ones that were plaguing him in FP1, and his gesticulating across the line when he set his first timed lap suggested his tether was running ever shorter. Antonio Felix da Costa wrestled back the stranglehold on top spot from Di Grassi on the 20 minute mark, and the BMW i Andretti Autosport man’s time of 1:08:262 resembled a fair way off the best times banked in at the end of FP1. Andre Lotterer brushed with a dastardly fate coming out of Turn 11, coming within a whisker of bashing his DS Techeetah against the outside wall, while Jose Maria Lopez was adjudged by Robin Frijns to have possibly brake tested the Dutchman coming into Turn 8. Frijns managed to shrug off the encounter, however, and placed his Envision Virgin Racing car into second. 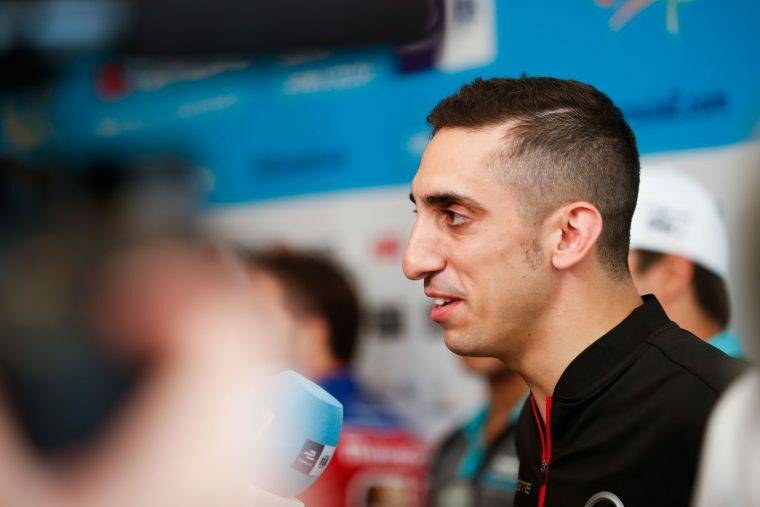 Buemi, meanwhile, pumped out a banzai lap full of dices with the barriers surrounding his inner boundaries, placing his Nissan e-dams 5th in the time sheets. And his daredevil wrangling of his machine came back to bite him – the season two champion buried the nose cone of his car into Turn 5 after entering with uncontrollable heat. He limped back to the pits, dragging the collapsed remains of his front wing along with him. 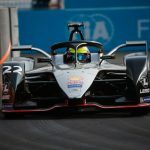 Pascal Wehrlein was spotted with attached debris flapping on his left rear wing plate shortly after, and also parked his stricken Mahindra Racing car into the pits. The German starlet smacked the outside barrier into Turn 6, which forced him to abort his flying lap. Gary Paffett trod the path Wehrlein had carved out when he too came into contact with Turn 6’s outside wall, but unlike him the HWA Racelab man managed to continue unharmed. 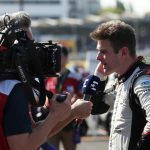 Da Costa continued to lead the way at the top coming into the final five minutes, an emulation of his predicament in FP1 – only to have it snatched away by Rowland. And as one Nissan e-dams pipped him in FP1, another would commit the same act this time round. Buemi swooped in to top the timesheets, while Venturi managed to improve on their trying first free practice performance. Frijns bailed down into Turn 5 on his final flying lap, but it would not take the attention away from another strong Nissan e-dams showing – could they go all the way in Sanya?